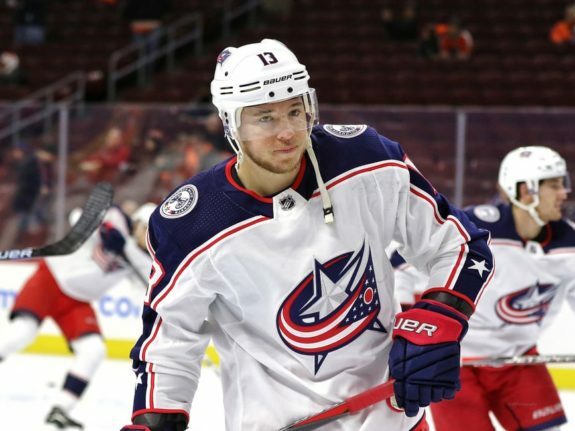 NASHVILLE — Cam Atkinson scored twice and Artemi Panarin had four assists to lead the Columbus Blue Jackets to a 5-2 victory over the Nashville Predators on Saturday night for their fourth straight win. David Savard, Oliver Bjorkstrand and Boone Jenner also had goals, and Sergei Bobrovsky made 23 saves for Columbus, which maintained its hold on the final wild-card spot in the Eastern Conference playoff race. Bjorkstrand scored with 2.5 seconds remaining in the first. Bobrovsky stopped a point-blank chance by Nashville’s Colton Sissons with 12 seconds left in the period, and then Panarin led the puck up ice before finding Bjorkstrand in the right circle, where he scored his 20th of the season with a wrist shot high to the glove side. Atkinson was stopped by Saros on a penalty shot with 4:47 remaining in the game, denying his attempt for a hat trick. NOTES: Panarin’s 56 assists on the season established a Columbus franchise record. … Nashville D Dante Fabbro made his NHL debut. Fabbro, the 17th overall pick in the 2016 Entry Draft, signed with the Predators earlier this week after completing his junior season at Boston University. … Arvidsson extended his scoring streak to three games. … Bjorkstrand has scored in four consecutive games. … Columbus is 31-7-2 when scoring first this season.